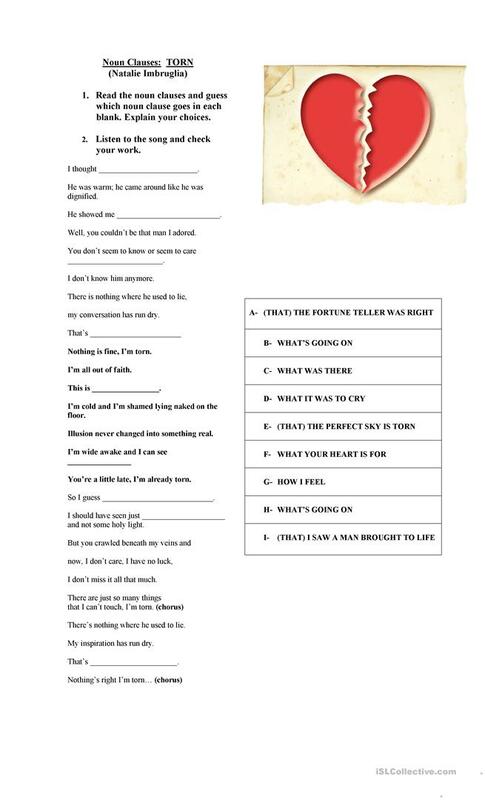 This activity is a song for students to have a follow up activity after they have learnt Noun Clauses. The present downloadable worksheet is intended for high school students and adults at Upper-intermediate (B2) level. It is valuable for teaching Nouns in English, and is a valuable material for working on your students' Listening skills. Claclina is from/lives in and has been a member of iSLCollective since 2014-12-01 12:38:41. Claclina last logged in on 2018-10-23 14:42:33, and has shared 2 resources on iSLCollective so far.